Completed in 2010, 903 Poydras Street is the first residential high-rise constructed in downtown New Orleans since Hurricane Katrina. The 21-story, 462,000-square-foot mixed-use residential space building is comprised of 10,000 square feet of retail space at street level, plus residential tenant space that includes 250 apartments, a lobby, pool deck, and fitness center, and a 500 car garage. The architects at Eskew+Dumez+Ripple designed the building to stand out of the crowd of commercial office towers, and to reflect the city's signature sense of place – a place of community and belonging. The architect's design approach focuses on enhancing human experience. Inspired by New Orleans’ historic courtyards, they designed the building's ninth floor to create a communal space—a hub for social interaction, and a virtual courtyard in the sky. In this double-height sky lobby, residents have access to a coffee bar and movie screenings, as well as a pool deck and fitness center – encouraging the human interaction and community environment that is the culture of New Orleans. 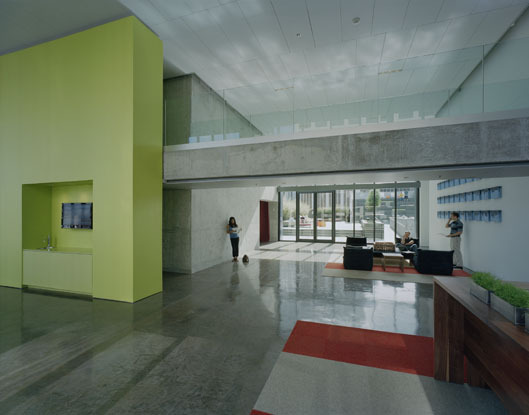 In the two-story lobby of glass, metal, and concrete, acoustics were a major concern for Eskew+Dumez+Ripple. The building resides in a dense downtown environment with heavy vehicle and pedestrian traffic on one of the busiest streets in downtown New Orleans. The architects wanted to minimize reflections and create a comfortable environment for conversing, reading, and relaxing, so that the ninth-story communal space would feel like an extension of residents' own homes. However, traditional acoustic ceiling products tend to give a soft look that would conflict with their design vision, which consisted of clean, monolithic, solid surfaces. 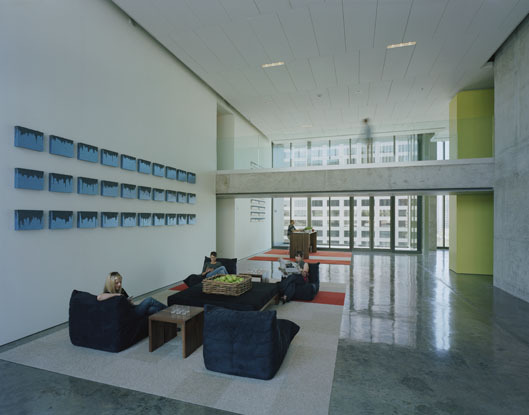 The architects found a design solution in Hunter Douglas Contract’s Techstyle® E ceiling panels, which provide acoustical performance. The panels have a clean, monolithic, drywall appearance, which allows them to blend seamlessly with the rest of the design. The architects focused heavily on creating interesting patterns with their surface materials—especially in the building's façade. They were able to continue this look in the ceiling of the sky lobby, using uniquely staggered Techstyle E ceiling panels to create an abstract pattern for the ceiling. "We are seeing a trend in the ceiling world right now, where architects are experimenting with non-rectangular patterns," said Ko Kuperus, senior R&D manager, Hunter Douglas Contract. "Techstyle® E allows them to do that easily."